It was a ritual in many British households on Sunday mornings: listening to Alistair Cooke's Letter from America. Cooke's manner was urbane, his accent appropriately mid-atlantic, his delivery paced and without histrionics. His tone exuded dispassionate, knowledgeable authority. Fifteeen minutes of calm speech on a Sunday morning. The series started in 1946 and ran until 2004, just a few weeks before his death: 58 years, during which Cooke represented the United States to Britain. That representation came through a filter that was a combination of soft-left Guardian journalist, soft-left F. D. Roosevelt admirer and Reithian BBC paternalism. It was a filter that no one questioned: it was urbane (there's that word again), unthreatening and entertaining. There are still many Britons, I am sure, who, in a world gone shouty, would be delighted to submerge themselves in 15 minutes of quiet urbanity on a Sunday morning. What Cooke said I cannot remember, although one or two images stick in my mind even today. Nor did the BBC take much trouble to preserve his Letters: many of them are still lost and many only recovered from two fans who faithfully recorded some of the broadcasts. Even the archive of his scripts is incomplete. That was a long time ago: we moderns now assume, with cheap digital storage, that everything everywhere is archived for the rest of time. This only holds true for the last two decades or so. However, there is one edition of Letter from America that I do remember, quite well in fact. The BBC tells me that it was last broadcast on Sunday 10 December 1978 at 09:15. I was abroad at the time and listening to it over a shortwave transmission from the BBC World Service. That may not be the exact moment that I was listening to it through all the fadings, whistles and uncertainties of shortwave reception, but it's near enough. Why do I remember uniquely that edition? Partly because it caught my interest at the time but mainly because within only a year or two it proved itself to be an exceptionally stupid opinion piece that revealed the biased and paternalist mind that was behind it. It was beautifully written – a craftsman at work – but it was fundamentally vacuous. These were the times before blog sites, commenters and social media. Cooke's words would work their magic and disappear. Only by a fluke am I now able to confirm what I heard in December 1978. Last Thursday, the newspapers and the tube paid their annual respects, or regrets, to the Japanese attack on Pearl Harbor on 7 December 1941, a day, President Roosevelt said at the time, 'a day that will live in infamy'. However, two days before that, if I may fall back on my mental arithmetic in lieu of a computer – on which I notice shop assistants now solemnly punch up the problem of adding three cents to 97 cents – two days before December 7 was December 5 1978, a night which will surely live in American history, for veteran opera-goers taking their seats at the Metropolitan Opera were astounded by an event which has never before taken place in the history of the Republic: a sitting President of the United States took his seat at the Metropolitan Opera. Nothing should be made of the fact that the opera was Aïda, an opera on an Egyptian subject commissioned by Isma'il Pasha and first performed in Cairo, though I'm afraid that something may be made of it by ill-meaning journalists in and out of Israel. In which case, the president could handily make amends by commissioning a performance of Handel's 'Israel in Egypt'. Cooke's remark that 'something may be made of it by ill-meaning journalists in and out of Israel' is revealing of a mindset that is still with us: 'blame Israel'. The farce that was Carter's Camp David Accords, which brought no peace, just uproar, had been freshly played out by the time of this broadcast. The fact is, quite simply, that President Carter is something of a freak among the long line of American presidents. He is a music lover. I don't mean that he has his favourite tunes, as haven't we all? President Eisenhower, I believe, let it be known that he had a pack of favourites which he liked to have piped in on social occasions so that he could hum to them. As George V, on a memorable occasion, his fifth visit to his favourite opera 'Rose-Marie', sat in the Royal box and having conquered his favourite song in the whole of music, confidently accompanied the chorus singing 'To tum tum tum, to tum tum tum …'. I mean that President Carter is the phenomenon of an intensely hard-working president who yet finds time, every morning, every dawning I ought to say, to listen to a half hour or so of Mozart. It's hard to think of a better prescription for rinsing out the mind before the growing cacophonies of the day. That last paragraph stayed in my mind through the following couple of years in which Carter self-destructed. He would subsequently go down in history as one of the few US Presidents to lose an election for a second term. In the single term he had, 1976-1980, his angst-filled messages and guilt-ridden worrying depressed the American psyche. The Camp David Accords, so full of naive hope, turned into a disaster within weeks. His micro-management ('intensely hard-working president'), particularly of the humiliatingly botched rescue attempt of the Iranian hostages, meant that there was no other place for the buck to stop than on his desk. It took the smiling, confident Ronald Reagan to bring 'morning in America': he defeated Carter by a landslide in 1980. Carter left office with an appropriately terrible approval rating. Clearly, 'rinsing out the mind' first thing in the morning doesn't work. Perhaps taking Reagan-style naps would have been better. At least, when the great micromanager is asleep he can't be messing up. It's fascinating, though perhaps not very instructive, to wonder why politicians who regularly acquire some strange bedmates should so rarely relax with the muse of music. With classical music, that is. Lovers of Harry Truman will be bound to protest that he actually played the piano, chopped his way through slices of Chopin and, at all times, was ready to give a soulful performance of the 'Missouri Waltz'. But having heard him and followed his tastes, I must say that his range was that of the excerpts we staggered through on the piano when I was a boy, a series of what were called 'The Five Star Folio’ which incorporated the most swinging bits from the 'Poet and Peasant Overture', 'Zampa', the 'Four Indian Love Lyrics' and what were conveniently known as 'middlebrow classics'. And I'm sure that out of Texas will come the reminder that whenever at a barbecue or other local festival, Lyndon Johnson heard 'The Eyes of Texas', the tears cascaded freely down the clefts of his face. 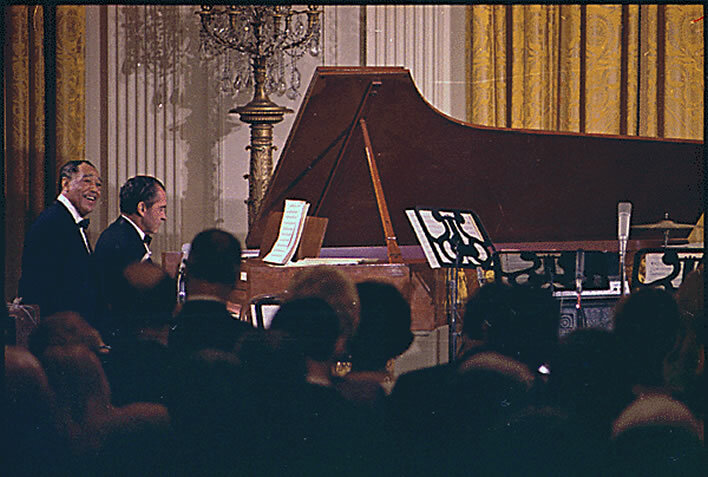 President Nixon, too, was almost as eager to get to any piano in sight, as George Gershwin was, about whom a close but clear-eyed friend said, 'An evening with Gershwin is a Gershwin evening'. Nobody thumped away with more genuine zest and pleasure than President Nixon, and I imagine he treasures as one of the precious mementos of his presidency the moment when, in full view of an ebullient audience, the late Duke Ellington kissed him on both cheeks, the last time, I believe, Mr Nixon was kissed in public except by a next of kin. The first of these two paragraphs is elegant mockery and as such is much to be admired. The second is just a hatchet job on poor old Nixon – not even a stilletto, a simple hatchet. Nixon was a fine pianist. It is said that had he not taken up the Law and gone into politics a career as a concert pianist would have been a possibility. For Cooke, however, he was the egotist 'eager to get to any piano in sight' on which he 'thumped away' with 'zest and pleasure'. Let's not mention skill or talent. He could also play the saxophone, clarinet, accordion and violin – we do not know how well – but to dismiss him as a musical bozo is quite unjust. If you are looking for a musically outstanding president, Nixon is your man. That unsophisticated musical simpleton President Nixon. Top: Playing the piano for Duke Ellington's birthday celebration. 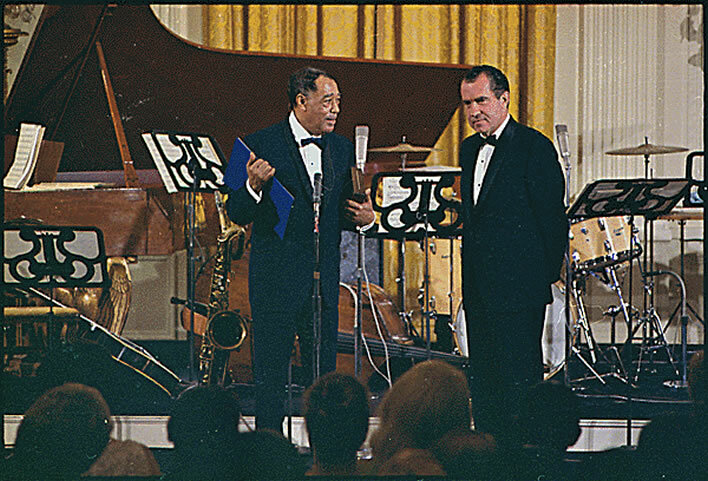 Middle: Presenting the Presidential Medal of Freedom to Duke Ellington. 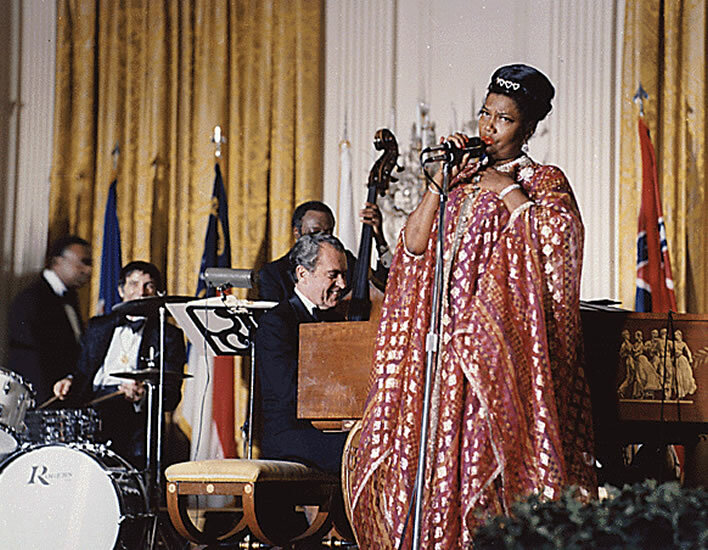 Bottom: Playing piano at the White House while Pearl Bailey sings. Images: archives.gov. Now, in case an overseas listener is beginning to preen himself on the superior cultivation of his own politicians, as distinct from the rude, American kind, I beg him or her to take thought. Name offhand, or even after much boning up, any politician of the first chop who is or was a known lover of classical music, apart, that is, from the dazzling exception of Mr Edward Heath. Mr Gladstone, my father told me, was properly reverent when called to Buckingham Palace to listen to performances of so-called 'sacred' music commissioned by Queen Victoria. He would have been a brave prime minister who refused the royal command to listen to any musical performance, however sacred, however stupefyingly dull, that was commissioned by the Queen. But I don't remember from the memoirs – though doubtless I shall receive a barrage of indignant letters from old relations and fans – I don't remember that Balfour, Lloyd George, Asquith, Bonar Law or any of their generation had the slightest interest in music. In the many volumes of the works of Winston Churchill, I can find no reference to any of the top-flight or even third-flight composers, though Mr Churchill, also, was known to weep whenever the 'Battle Hymn of the Republic' was played. As for the succeeding generations of British politicians, and I hope I do them no insult, I cannot find either that Anthony Eden was an accomplished cellist or that Mr Callaghan devotes his spare hours to reading the scores of the Bach fugues. I do recall, and was actually present once, when the astonishing thing happened that the 1st Lord Birkenhead was tone deaf and had to be nudged to stand up whenever the band went into the national anthem. Now going back for a minute or two to the startling event that produced all this speculation, I must say it seemed extremely unlikely that some president at some time or other did not find it expedient, let alone pleasurable, to attend the opera. A friend of mine, who knows not only all the obscure operas of the great composers but also all the mediocre operas of the obscure composers, did a little digging and came up with the nugget that in 1918 President Wilson did indeed appear at the Metropolitan Opera House, but it turned out that he was there, as usual, not to listen but to perform. Not, so help us, to sing, but to make a speech before a rally called to stir up support for the League of Nations. And, there's an unauthenticated rumour that, at another time, President Wilson dropped a hint to the New York authorities that he might come up to the city to attend the opera, but when he discovered that the opera was to be performed on the Sabbath, he was shocked into withdrawing his request. Further painstaking research reveals that there is one other president who not only had the wild impulse to go to the Met but yielded to it. Not, however, in New York. The Metropolitan Company was on tour in the winter of 1905/6 and when it appeared in Philadelphia, President Roosevelt, enjoying what was till then the biggest popular majority any president had ever received from the voters, took himself off to see and hear – who else? – Enrico Caruso. He must have slipped into the house, if any figure so mountainous can ever be said to have slipped in anywhere, or at least not tipped off the management because when the performance was over he went backstage to greet the great man, the other great man, and Caruso, we are told, believed for an awkward time that he was meeting an impostor. But when he realised that he was, indeed, being visited by the incomparable T. R., or Teddy, he threw his arms around the president and, anticipating Duke Ellington, smacked a kiss on each cheek. There was a photographer present, a small fact I mention because the following April Caruso was performing in San Francisco and, early in the morning of the 18th, he was asleep in his lavish suite in the Palace Hotel when the bed started to shake and the chandelier to swing and, in a word, the hell of the famous earthquake was let loose all around him. He dashed out, like many another human, in a nightgown and bathrobe into the courtyard of the hotel and begged for transportation to the ferry that would take him to the railroad and save him from disaster. What must have been an agony of conflict between safety and egotism he tried to think of some single possession he could not bear to lose. He dashed back and rescued the photograph of himself and Teddy Roosevelt. By the way, he arrived days later at Grand Central Station in New York, still in his dressing gown and when a crowd of reporters asked him what it was like he said, 'It was worse than Vesuvius'. I was pondering this unexplained puzzle, why politics apparently work through the nervous system to produce an allergy to first-rate music, when one of our television networks went into a kind of visual essay which it does regularly on the nightly news. It was done, this one, I imagine, as an oblique commentary on the news of the 20-year treaty of friendship which the Soviet Union has just signed with Afghanistan. It was about the Mongols and the Thais who live in different regions of the borders of communist China. To keep them friendly, we were told, the Chinese allow them to live, and I quote, 'independent lives according to their own customs within the political framework of Chinese communism'. I must say, this sounded to me like saying that the Jews were allowed to live independent lives according to their own customs within the political framework of the Third Reich. Anyway, what we saw mostly was young people dancing to charming music. The Mongol tots danced with rifles, the Thais with rifles and fixed bayonets. Evidently there are some cultures in which the rulers have learned how to blur the brutality of their politics by marrying them to music, for export purposes only. Well, the fact remains that Jimmy Carter is the only president who has ever attended a performance at the Metropolitan Opera House, but it turns out that last Tuesday night's opera was a fundraising event, twenty-five hundred dollars for two tickets, to help the former Mayor Beame pay off over a quarter-million dollar debt to his campaign backers, who backed him and lost. Present at the opera was every big-time Democratic politician in and around New York and a dozen labour leaders. Even if he didn't love Verdi so much, I suspect that President Carter would have gone to the opera. The music, like the music that accompanied the drilling youngsters of Northern China, helped to soften his grim determination to do anything to secure the New York vote in 1980. What are we to make of this? Cooke now tells us that the opera that Carter attended was a Democratic Party fundraiser. We recall now with puzzlement the 'veteran opera-goers taking their seats at the Metropolitan Opera'. Never mind – Carter was simply more cultured than any other politician in the English-speaking world: 'Even if he didn't love Verdi so much, I suspect that President Carter would have gone to the opera'. He was there primarily to butter up the New York Democrats and the music was really only a sideshow, although Cooke tells us this in such a roundabout way that it is difficult to imagine the radio listener disentangling this mandarin sophistry in realtime. Despite the sophistry the listener is left with the notion of Jimmy Carter, the cultivated president, as the only true 'music lover' among them all. It doesn't matter that, unlike the musically talented Nixon, he couldn't 'thump away' on an instrument but merely listened to music as a way of 'rinsing out the mind'. For Cooke, Carter was the only truly cultured politician in the English-speaking world – that is, apart from Edward Heath, another one who met a bitter political end. God help us!